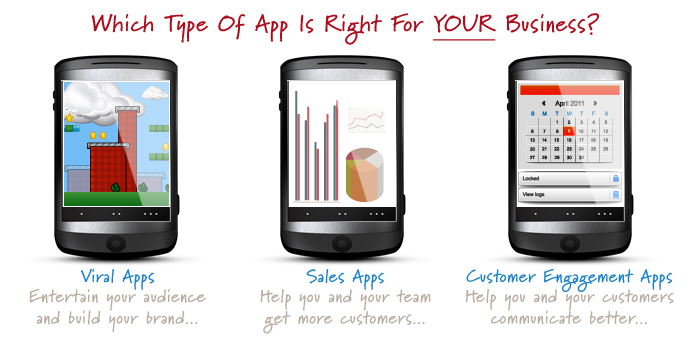 The world is "going mobile" in a big way, and your business needs to as well. There are more than 3 billion mobile phones in use right now. Shockingly, 1,000 more are activated every minute of every day. That's right - In the time it takes you to read this page, 1,000 new mobile phones will be activated! Luckily, it doesn't need to be time consuming or frustrating to get your business mobile. We've created numerous apps for our clients, ranging from viral games to mobile inventory systems and mobile banking solutions. These are entertaining, and build brand recognition. We've worked on several games and viral social applications that fit into this category. These help you and your sales team operate more effectively in the field. They help with the lead generation and sales process, and allow you to turn potential clients into paying customers. We've worked with a wide range of construction, diagnostic, health care, and shipping and manufacturing clients on sales applications that do everything from track orders to manage clients and invoices, allow order customization, and show customers' reports and updates. These improve the communication flow between you and your customers... and make it easier for them to work with you. For example, we've built mobile banking applications for banks, reservation and booking systems, real-time calendars for an insurance company, and a "customize your new home" application for a prominent national construction firm. Everything is done either in-house, or through our close network of long-term strategic partners. We don't outsource anything, and so there are never any unexpected delays or issues. Whatever type of application you need, chances are it will have to work seamlessly with your legacy systems. We've integrated mobile systems with applications like SAP, Salesforce, MS Dynamics, Sage CRM, SugarCRM, WebLink Chamber of Commerce Software and many more.